In Riverside, you will find young professionals who are new to the area living next door to homeowners who have owned their homes for 30+ years. Most of the homes were built in the early 1900's to1920's, but most have undergone remodeling and major updating. Each street has quite a mixture of home styles that stem from the original "Rowhome." Typically, homes are 2 or 3 bedrooms, and have small yards or parking pads located in back. Many small restaurants and dining options are popping up and succeeding in this thriving neighborhood. 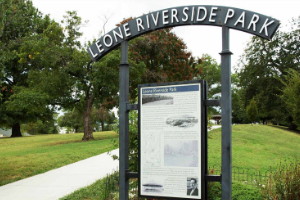 Leone Riverside Park is the hub of this neighborhood, which is home to many ball fields & basketball courts, a children's playground, public pool, pavilion space, and many acres for dog walkers to enjoy. It's common to see the various social leagues playing softball, football and even kickball in the park.